Beginning a short series (how many times have I said that now?) leading up to my Emerald City Comicon coverage, I’d like to share what I have learned about the public transit that quite a few people take to get to the convention center. As the admittedly speedy narration crawl says, I’m looking to share tools I’ve learned to deal with my Asperger’s Syndrome. So to start of explaining the usefulness of THIS tool (meaning the transit and not myself) I thought I’d start with Metro Customer Service. Point out what’s near to it, the way the nearest stop is significant, and the easy access to Chinatown for other events in town. Spoilers (? )… Who’s who? I think you can guess from the picture above. Although this is the concept art from before the series launched. What sets all this in motion? 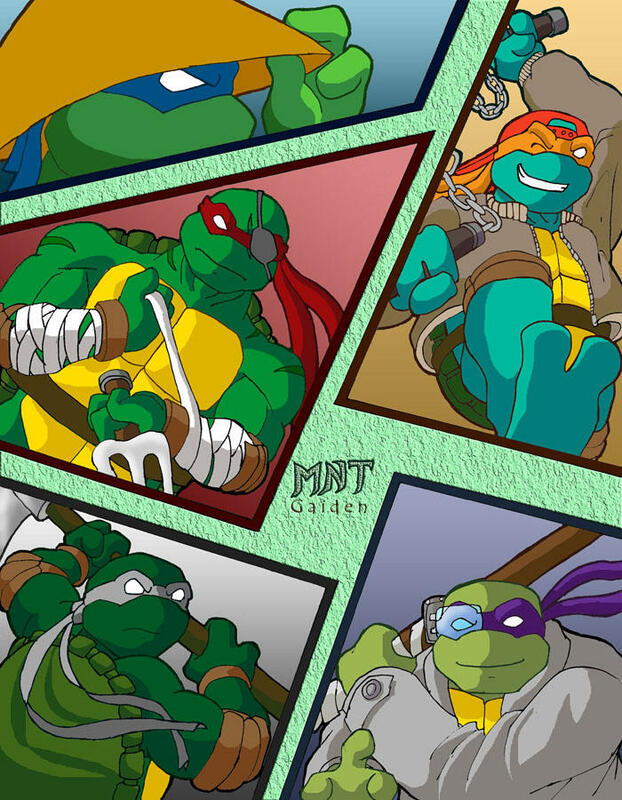 In “Present” day, the still-teenage turtles receive a mysterious item that turns out to be cursed, and after a lot of damage, Master Splinter sacrifices himself to protect his children. Scattering them to the winds in the process. 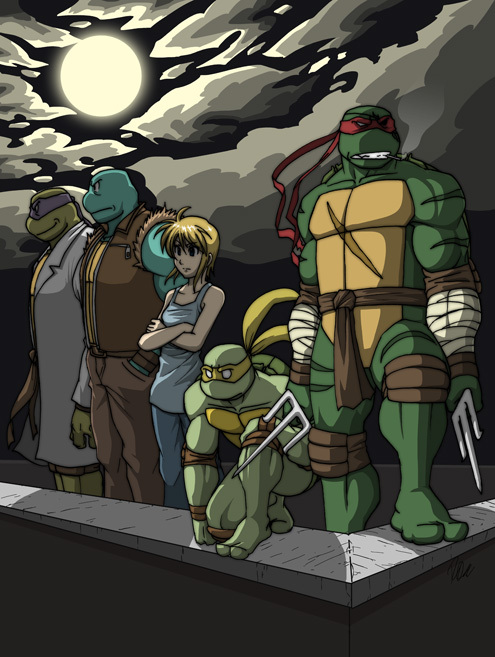 For much of the story, Leo is away in Japan studying the cursed Kusanagi Katana that was sent their way, leaving a devastated Raphael to watch over what’s left of the family. 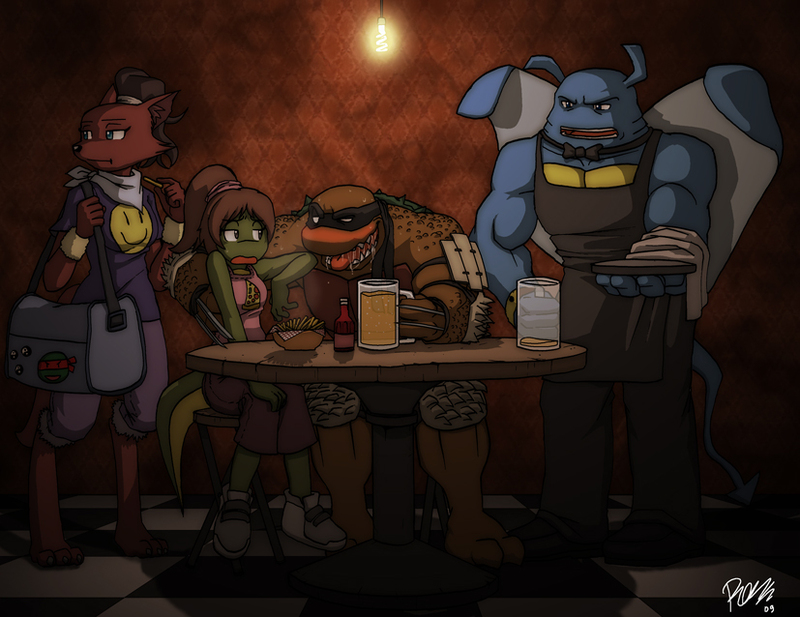 With Donatello “preoccupying himself” in an underground lab (even dirtier than that sounds, but in a MUCH scarier way than you’re thinking); and Michelangelo moving in with April and her family, that’s still manageable even in light of Raph’s own struggles. 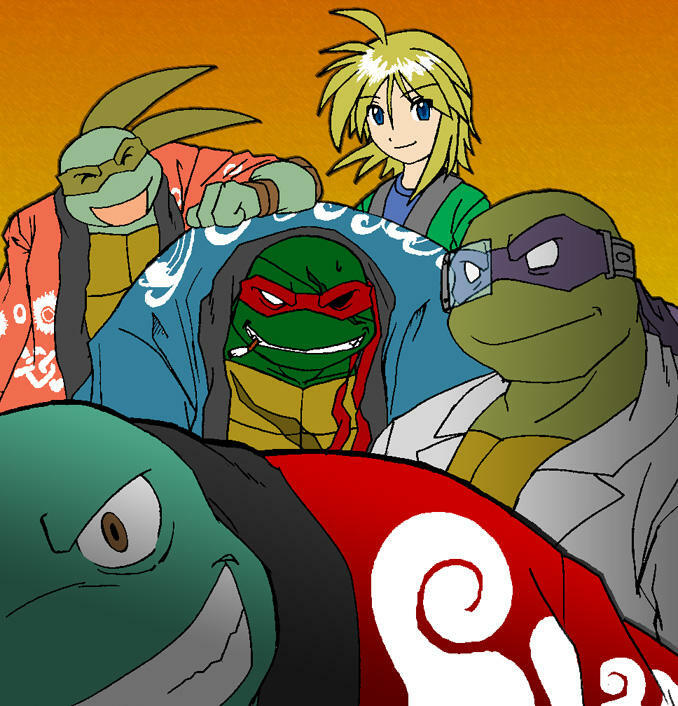 Meanwhile the new teens (only one of them in a half shell) start out with an irritating day of school being interrupted in the most horrifying way, in one more fashion for making people afraid of giant talking turtles than they already were. Suddenly finding himself in the reptilian body of his own killer, a young man named a Augustus is “adopted” and renamed Renoir as he and his old friend Shadow try to find answers that explain his current situation while he seeks his identity. Meanwhile their girlfriend is more and more plainly connected to the curse as she too is pulled into this circle of events. While the regular comic plays host to many themes and narratives ranging from the original Mirage comics to the (no longer canon) Image comics, but Bakabakashii throws in ALL the comics, including the Archie Comics drawn from the original 80’s cartoon. It’s purely comedy, and I dearly miss it, but if pulling out that that energy means putting that energy back into the main series. http://www.mntgaiden.com/wordpress/comic/mntg-chapter-24-p-16/ Sadly their upload schedule can go nearly a year without posting. 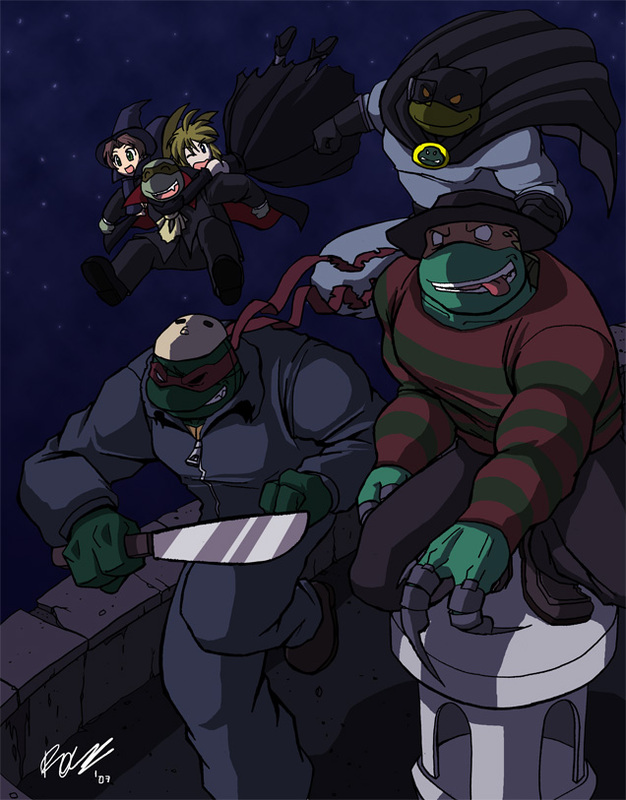 But like Raph said in the first movie, “I sure hope there’s more of them!” In the link above is today’s posting. So there’s hope moving forward. So after pledged to focus on convention-relevant material, why am I bringing this up? Star-Shells (or Half-Bucks?) Part 1. But first we’ll deal with the new Black and White menu from Starbucks and where to find them at con. https://www.starbucks.com/store-locator?map=47.612837,-122.33318,17z Keep in mind that this link brings up a zoomed in link, and the eastmost Starbucks is the local Roasterie Reserve. The very first one, I believe. And keep your eyes out for 7th & Pike. For quite a few years, it was the only place to get convention-specific drink mixes. But as of 2017, several other stores in the immediate area were also selling these for Comicon and Sakuracon. Even the ones in the City Center shopping complex. Yes, it is a small mall, and yes, they do have multiple Starbucks. I tried to make the options more clear in this pic. But onto the coffee. It was available in Espresso, Frappacino, and Hot Cocoa varieties. Boasting white mocha, black mocha, and whipped cream topped in crumbled black chocolate like a bow. Oh, the espresso option. Let’s just get this out of the way, because I’m not sure what to say. The espresso flavor is so strong and so dominant, but then I’m tempted to make some very inappropriate whips & chains humor. But sadly, no fully articulated joke comes to mind, and I’m not sure that this is the proper platform to tell it anyway. So, we all know that as the ongoing weather patterns in any given area change shift, becomes harder or easier to grow certain types of food in certain places. Traditional coffee plantations are beginning to feel the pinch. So your fix is not only going to be harder distribute on account of scarcity, the price will go up, that’s not accounting for how many households the world over waste food because they don’t realize how much is still useful. So, let’s look at the actual flavor. It’s espresso flavor. It’s still espresso flavor but competing with other flavors. You will notice me later trying to discuss the efforts to describe taste and smells with words for second sound. Well as someone who actually thinks processes his thoughts in sight. So I see espresso is like one of those ships in the new(ish) Battlestar Galactica where it is a long cylinder device with a big ring around the middle. The espresso is long, ongoing, massive and everything else just orbits a small section of it whenever you try to add flavor to it. Which makes espresso a poor choice for specialty drinks and seasonal flavors, because for the most part all you will ever taste is espresso. So once you get through all that, how does it taste? The espresso itself is certainly not dull, but I think for once it’s actually working in tandem with the dark chocolate. Although you only get a sense of that through aftertaste in which case the dull shadows of the espresso are finally competitive with the dull shadows of anything else. Whenever you actually drink it it’s pretty much just an espresso otherwise things melt into it, the espresso tastes different. While I could taste everything at once, or at least all the flavors added at once in the frappe, in the hot cocoa I taste mostly sweet cream with veil of a chocolatey mist, if that makes any sense. I’m not sure how professional food critics do this using sight & sound metaphors to describe smell and taste. Clearly I’m on the learning curve. The little bits of chocolate that form the bow tie in this tuxedo themes drink, the seem to melt the quickest in the Coco rather than the espresso. Plus the flavors balance the best in the Coco. With the Frappuccino, it tastes like white mocha with a bit of coffee flavor at it. It doesn’t really make the most of the black and white chocolate theme. So I honestly recommend the hot cocoa the most. Not only is it the cheapest, but it also balances all these flavors the best. It does the most with this theme, and it doesn’t on a budget. Plus I wouldn’t recommend Frappuccinos in the cold weather we’re having here. Especially not the cold wet weather. This is definitely hot cocoa season. Espresso just brings you down on a crash too hard. Next time, onto MNT Gaiden. http://sakuracon.org/hotels-travel/ is finally up. I’ve been checking regularly to see this to post it ASAP. I got my reservation, if that’s of note to anyone. But now onto the salad. Meet Morrigan Aensland from Darkstalkers. Darkstalkers is property of Capcom, who also feature her in EVERYTHING that’s part of their Capcom vs. Series. 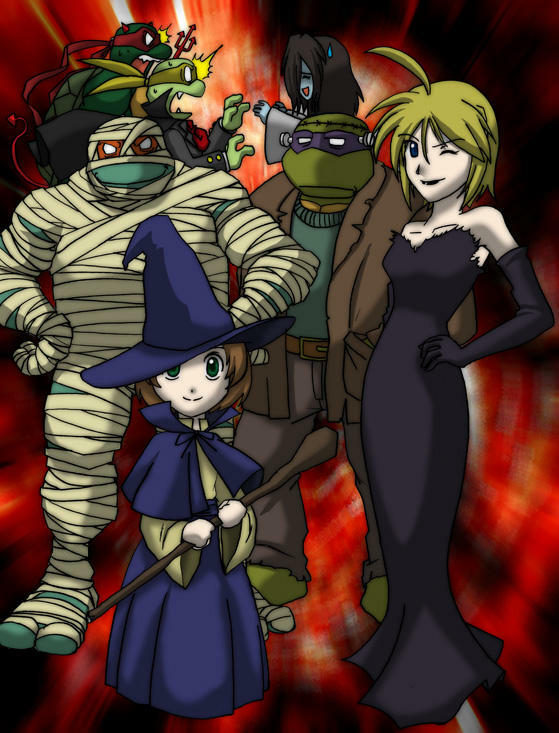 When I started the FandomFoodie brand, what I wanted to create more than any other topic, was original Recipies based on the Darkstalkers franchise. How does Morrigan Aensland, the resident Succubus, pertains to a salad? This is designed to be eaten after the meal. The ingredients are designed to 1) wet your whistle, 2) freshen your breath with a very minty aftertaste, 3) be the bridge between the meal and whatever comes after. Where moist minty mouths and fresh breath could come in handy. Start with the slicing one zucchini and one cucumber into thin strips. Then rinse and chop up some mint leaves. No need to fear the stems. Now that you’ve rinsed the mint and spread it around, do the same with the parsley and the cilantro, but in between those steps, chop them up finely first, so the actual breath freshening plant mass is almost (ALMOST) pre-chewed and packed into every bite. Now throw in the parsley flakes flakes to taste, and mix in the contents of the 3 tea bags. The original idea was to combine spearmint and peppermint among all the primary ingredients, but all I could find at the store was “Organic Mint.” Combining these two after all was a simple as finding Mint Medley by Bigelow teas. 3 was enough, and their only ingredients were peppermint and spearmint anyway. The parsley flakes were just for their light flavor, a little more breath freshener and because I throw that stuff in anything. Gradually the tea will rub against the squash (zucchini and cucumber) releasing a purple color. I’m not exactly sure why, but it suits the Morrigan Theme to a Tee. This recipe makes 5 large servings. Good for parties, but remember this. No dressing, this is to be eaten after the meal to freshen breath; 2: Cilantro begins breaking down before you know it, even in the fridge. Keep an eye on that, and buy up the ingredients shortly before you plan to serve. I originally came up with this as a way to bring the warmth and comfort of home cooking to those poor souls stuck at retail this year. Which means they wouldn’t HAVE any time with their families on one of the rare holidays where family time is considered STANDARD. It would also support them with protein and electrolytes stimulants and glucose. Not to mention a lot of other goodies to keep them going I’d actually like to take this along to the turkey trots. It’s got all the points that Gatorade needs. And after I share the recipe, I’ll get into why I didn’t post it before. Through all ingredients all dry ingredients together in mixing bowl stirring until stirring until as evenly distributed as possible then add boiling water on and off for at least 5 minutes so that what will dissolve has time to dissolve but do not let the water cool so much so that when you do the next step new line add eggs, that the eggs fail to cook in the water. Keep all wet ingredients in the refrigerator until it is time to use them because you want them to have a cooling effect to make the drink more drinkable sooner. Immediately stir the eggs inside the hot tea so that they blend together before they become more solid. Then add the pumpkin and the creamer and then until drink becomes milky in color evenly and maintaining a solid consistency throughout. This Pumpkin Pie Tea tastes like actual pie. I use garlic salt and that (cooked) garlic flavor shines through. The brew’s just a little bit salty, though. But otherwise it smells and tastes like pumpkin pie filling before it’s been poured into the crust and sets to cool. But it doesn’t burn your mouth, so it’s the best of both worlds. If I haven’t finished a project from 2017, I don’t think I’ll continue it in 2018. I’m trying to focus my efforts outside of this, so I’ll be minimizing what I do here to save time as I do my part to address Net Neutrality, accelerate Job searching, community volunteering, and other things I need to do. This blog will be about sites and eats around the Washington State Trade and Convention Center. To get ready for Emerald City Comicon on March 1-4, and Sakuracon from March 30-April Fools’ Day (won’t that be an interesting end to a weekend?). Both of these will be held there. So I’ll be preparing for those events to help any readers who will be attending. And I’ll be sharing these articles on more sites so I can garner more of a readership. This is going to be a new year, and a new approach as I face new needs. I have several priorities at a time, and as regularly inspired for this as I am, I still have to place this as my lowest priority endeavor (hence putting this out on the 4th instead of the first). I’ll still be posting, I’ll try to maintain my Dinner and a show format, but I will miss writing for you all anyway. Sorry for poor picture quality, I thought I had misplaced my camera (Had actually misplaced it in one of my many pockets) so I had to catch this on my phone and run. And for my meal portion… Original House of Donuts in Tacoma, Washington. I was looking for work amidst downtown Tacoma’s renovations over New Year’s Weekend when I found them. Word of warning for those in the cold. The lobby is solely for paying customers only. The cheapest item I found was six donut holes glazed for $1.50. The one I recommend is a singular or blueberry donut, made with real blueberries, not glazed but talk with blueberry frosting made with actual blueberries. Who could actually taste the blueberries in separately the frosting and the donuts, but there are cheaper plate have got to be cheaper places downtown to take refuge. The maple bacon bars on their business cards. Oh weather without taste for maple bacon pastries, it’s a very charming notion or construct anyway. Here’s their website: https://www.originalhouseofdonuts.com/ From there you get to their Facebook, Twitter, Instagram, and …YouTube?